Copenhagen Fashion Week is under a new management. And what used to be a rather slow-burner of a fashion week has turned into a fast and efficient few days of fashion. The first day was full of Danish Fashion newer faces and geared toward the more avant-garde crowd. The highlight of the highlight was surely the Soren Lesschimdt show. With several dresses voted Dress of the week by tabloids and magazines in Denmark, Soeren Leschmidt is far from a complete newcomer, so naturally, a lot of interest and excitement was built up ahead of his first runway show, which was easy to tell by the number of people attending the show. Soeren Leschmidt has an eye for bold details that transforms subtle classic evening wear to something extra and more. They are stand out pieces that do well on the runway, the red carpet and at any occasion where one wants to be seen and make an impression. Soeren Leschmidt designs both men- and womenswear, he presented a beautiful and exquisite collection that did not lack in neither tailoring nor finishing. From suiting and long dresses to pantsuits, cocktail dresses, and outerwear, the collection featured it all. The color palette was simple and easy with tones of black, white and crème with splashes of bright bold yellow and petrol green. Small bold details such as a surprising open back in suiting, cape effect with open back and drop-crotch pants for men were featured throughout the show. Most of the looks left an impression such as the short petrol green dress with cape-effect as well as an open back and the yellow fitted dress with asymmetrical bust-line. The high-waisted pants were done in layers which added a bit of humor to the collection. The men’s suiting was slimline and borderlining oversize although yet remained very classic. A color-blocked jacket with small lapels and a hoodie underneath was also among the stand out pieces. Another stand out piece was a petrol and black army colored suit with slightly puffed sleeves. Among the crowd favorites were a pin-striped blazer-dress with large and flowy sleeves styled with a fitted bright yellow dress body stocking underneath as well as the petrol pantsuit with low back and an asymmetrical white dress which was also the showstopper. 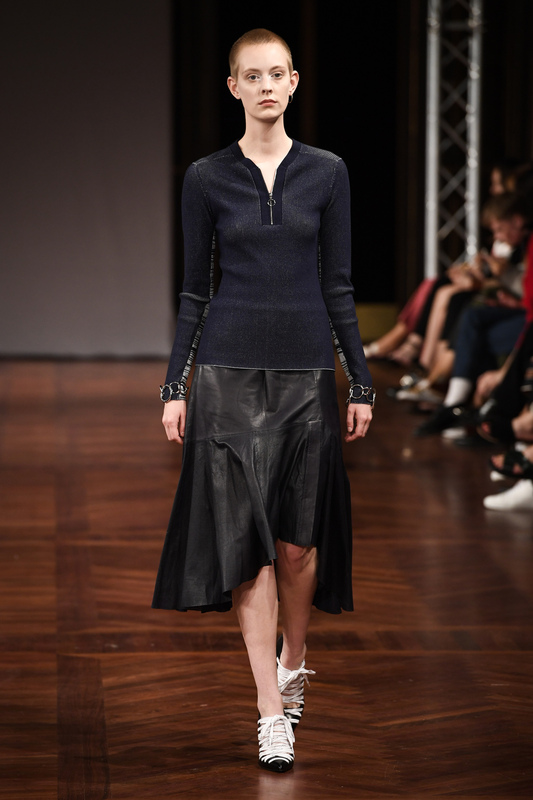 Soeren Leschmidt is an exciting new Danish designer, who already has won the crowd over. He is definitely one to watch in years to come. 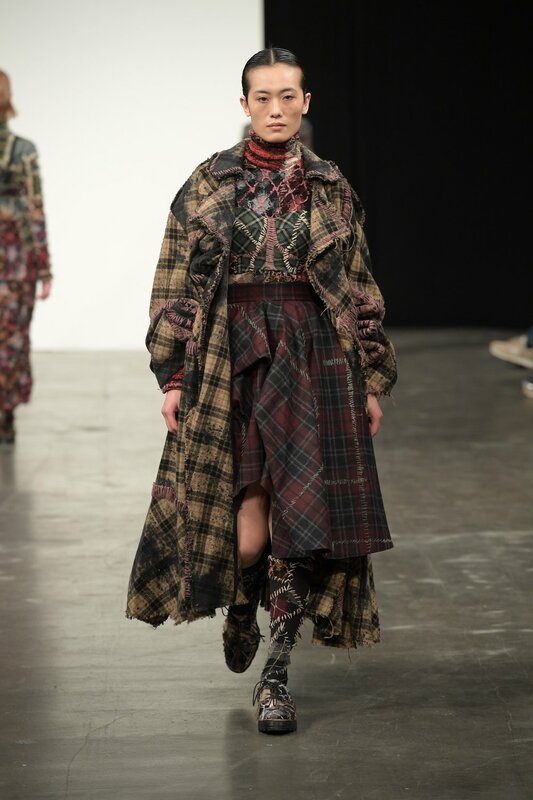 As always, Designers Nest presented their award and finalists with a show at Copenhagen Fashion Week. Ten very diverse new young designers presented capsule collections of five looks at a closed down train workshop in the outskirts of inner Copenhagen. This year’s first place winner, Henna Lampinen of Aalto University in Finland, presented a collection inspired by the factory workers of 2nd World War, 50’ies housewives and silver screen goddesses. Unusual combinations of textiles and techniques, she presented an interesting collection with classic silhouettes and bold materials. Inspired by ‘Make Do and Mend’ spirit of wartime England, she also upcycles materials to give garments a second life. All five looks of the capsule collection stood out, and while there were many exciting new designers and point of views among the finalists, it is easy to see why she won. The second-place winner with the rhythmic name; Tuuli-Tytti Koivula was also from Aalto University in Finland. Inspired by creepy fairy tales and grandmother stuck in the 1960’ies, she created a collection with frills, distorted strawberries motifs and plastic trimmings. At first glance, delicate fabrics came down the runway, but a second glance revealed plastic bags which were repurposed and used as trimmings and nuanced details. Her collection was fun, fresh and colorful. The third-place winner was Ali Akbari from Oslo National Academy of the Arts. Inspired by the Afghan culture and clothing culture, wherein an Afghan family with only daughters can turn a daughter into a son until she reaches the age of marriage. During her time as a “boy”, she will dress and act as a boy allowing her more freedom, before she must return to a gendered life as a woman. With handwork, beading, and tailoring, the young Afghan designer created a collection that narratives how garments can act as a way to freedom. Prior to the Designers Nest award show, finalists have gone through a careful selection process administered by a jury, who selects ten young designers to show a capsule collection at Copenhagen Fashion Week. Prior to the show, they will also be interviewed by the jury before the winner is chosen. Blanche was originally founded and launched as a sustainable jeans brand in 2017 by Melissa Bech and Mette Fredin Christensen, and evolved into a darling among influencers and fashion editors alike. Blanche held on to that thread of consumerist ideology and provided a collection worthy of insta-love. The seamless nature of Blanche’s lines are unique within the context of Danish aesthetics. Tailored but not too stiff, Colorful but not too flashy are foundational aesthetics of Blanche and it is likely Blanche is going to be a favorite for many years within the Scandi market. House of Dagmar is a Swedish fashion brand. And like all things Swedish the coolness factor drives the brand. But beyond the 'hip' is a foundation that incorporates classic Swedish craftsmanship. The brainchild of three sisters and named after their grandmother, the house of Dagmar is finding a strong footing in the Scandinavian industry. But their appeal as a more universal brand is likely to make them go further than most other brands in Copenhagen Fashion Week. The SS17 collection was a solid display of what makes HoD an emerging force within the industry. Their knitted wear along with the duotone color schemes provided enough evidence that their sense of fashion is driven by realistic goals and an astute understanding of where the market is heading. A splash of color in a mostly neutral and dark collection added wonderful contrast to the collection and showed us why they are good at what they do. While the collection was not mind-blowing or experimental to the point of being irrelevant it held up its own under conceptual scrutiny every show must go through.